The pictures in the older blog entries and the image above were created using NASA World Wind, I did some cropping and colour adjustment in a graphics program. NASA World Wind is an open source program and can be downloaded for free. A very similar software is Google Earth, the basic version is freeware. More advanced versions with additional features need to be paid for, the free version is sufficient for the pictures discussed here. To a limited extent Google Maps offers similar functionality to Google Earth: Bowmore and Islay on Google Maps, use the + and - sliding bar to either zoom in and view more details, or zoom out and see Islay's position in relation to the rest of the UK. You can also switch between map and satellite view or use a hybrid view of satellite picture overlaid with a map. 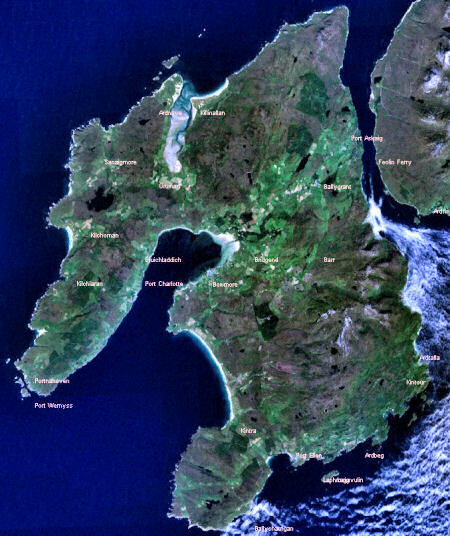 A similar service can be found at Windows Live Local, with this view of Islay from space. I haven't used this service much yet, so don't know much about its functionality. Unfortunately the resolution for the images of Islay (and the surrounding islands) isn't as good as it is for a lot of urban areas in the UK, so you won't be able to zoom in on individual houses, but you can still make out quite a few things.